Gaden Shartse Monastery has eleven houses (or Khangtsen), of which Dokhang is one. Each house has its own administrative body to oversee enforcement of rules and regulations and the financial matters of the house. The most important function of each house is to provide accommodation to its affiliated monks. In recent years, the monks of Dokhang Khangtsen have experienced some difficulty and have lost their facilities, including their dorms and prayer hall. This has caused the monks of the house to be homeless, and forced them to find accommodations separately from each other after many years of communal living. In an effort to preserve Dokhang Khangtsen, His Holiness the Dalai Lama has helped secure a parcel of land for the monks to rebuild their facilities, and he has provided some seed money for the monks to travel to the US to continue raising funds for this very big project. Rebuilding Gaden Shartse Dokhang Khangsten is an enormous task. To rebuild the dorms and prayer hall it is expected to cost 1.2 million dollars. Our initial goal is $300,000, which will finish a portion of the dorms so that the monks can live together again as their facilities are rebuilt. 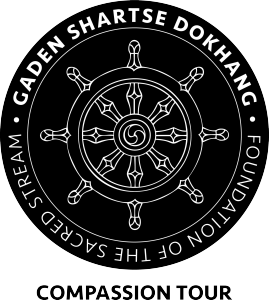 Historically, Dokhang Khangtsen has been referred to as the ‘right hand’ of Gaden Shartse monastery, on account of its sustained contribution over many centuries towards the preservation of Shartse’s traditions and monastic discipline. In the approximately 500 years since it was established, Dokhang Khangtsen has played a significant role in the dissemination and preservation of the Buddha Dharma, having trained several highly realized lamas and learned Geshes (most notably, Tri Jhangchub Chöphel [b. 1756], the 69th Successor; Tri Tsultrim Palden [b. 1839], the 85th Successor, and Tri Lungrig Namgyal [b. 1927] the 101st Successor to the Throne of Je Tsongkhapa). Geshe Thupten Jinpa, Ph.D., the primary English interpreter for His Holiness the Dalai Lama, is also from Dokhang Khangsten. Geshe Jinpa is the principal liaison for this tour and several of his senior students are accompanying the tour. Gaden Monastery is one of the three most renowned monasteries of Tibet. Originally founded in Tibet in 1409 by Je Tsongkhapa (1357 – 1419), a preeminent Tibetan preacher, saint, and Buddhist scholar, Gaden is where the Gelugpa School or the Yellow Hat Sect of Tibetan Buddhism emerged. The monastery was built on a majestic mountain just outside of Lhasa. Gaden quickly became well known for its moral discipline, academic strength, and spiritual values. Monks of all ages poured in from every part of Tibet, Mongolia, China, Japan and Northern India. By the 1950s the population of the monastery had grown to 5,000. The youngest monks started at age seven. All monks, irrespective of their specific focus of study, engaged in rigorous study at the monastery for many years. In addition to in-depth philosophical study, there were trainings in different vocations such as religious music, arts, sculpture, and administrative work. In the 1950s, the People’s Liberation Army of China invaded and occupied Tibet. In 1959, His Holiness the 14th Dalai Lama, the political and spiritual leader of Tibet, was forced to flee to India, where he established the Tibetan Government in Exile. Since then, India has provided a safe place for many Tibetans to live and keep their culture and religion intact. More than one hundred thousand Tibetans followed His Holiness the Dalai Lama into exile and are now living in India, Nepal, and Bhutan. Although Tibetans in India quickly established schools for children, the schools were not primarily centers for comprehensive Tibetan education, and Tibetan youth were becoming assimilated into Indian culture. Meanwhile, the Cultural Revolution was systematically destroying all centers of Tibetan culture and education inside Tibet. These conditions led some senior monks who had been trained at Gaden Monastery in Tibet to pool their efforts together. Under the guidance of His Holiness Dalai Lama, and with support from the Indian government and contributions from fellow Tibetans, these monks reestablished Gaden Monastery in South India, for the sole purpose of reviving Tibetan education, culture, and pure Buddhist teachings. Rebuilding Gaden Monastery in India was very difficult because of the severe heat, a dramatically different climate from Tibet. In spite of all the hardships, eighty-five refugee monks formed Gaden Shartse Monastery in 1970, near Mundgod, in the state of Karnataka, South India. Gaden Monastery in Tibet comprises two colleges: Jangtse and Shartse. Shartse Thosam Norling Monastery has produced many distinguished lamas and geshes, including several Gaden Tripas (Heads of the Gelugpa order) and Sharpa Choejes (tutors of the Dalai Lamas). The Jangtse and Shartse colleges were also reestablished in India as Ganden Jangtse College and Gaden Shartse Monastery. Over the next forty years, the population of Gaden Shartse increased to more than 1,200 monks, including resident scholars, writers, administrators and students from all over the world. Admission, instruction, and accommodations were provided free of cost. Preference was always given to children who were either orphans or from very poor families. Watch the documentary presentation video below to learn more.